It isn’t often you hear the word “transition” used in a positive light. The connotation is almost always negative. I have been thinking a lot recently about our most recent major transition as we moved to our current ministry one year ago nearly to the day. Even if you are transitioning to a “better” place, the process can be quite difficult. So what is it exactly that causes these times in our life (that can happen more frequently than we prefer) to be so challenging? Unsure of what is to come. In other words, OUT OF CONTROL. Uh oh! Raise your hand if you like to be out of control. Not a hand in the room. Transition means we don’t have the capability to have our life wrapped up neatly in a box. There’s no pretty bow to put on top. Things can be hairy and ugly. No one wants hairy and ugly. So how can we thrive in transition? The Israelites were transitioning from a state of slavery to a place of freedom. That’s good, right? Seems very exciting. However, as they were in the process of relocation, they could not get past two things. First, they convinced themselves and whined about how wonderful Egypt was. Nevermind the captivity, the brutal labor and terrible treatment. They had come to this emotional state where the comfort of the familiar was more powerful than the provision of God. Second, they were self-focused instead of God-focused. “I’m so tired” “I’m so hungry” “I want _” “That’s not fair” and so on and so forth. Do any of these phrases sound familiar? Though time and time again they had SEEN miracles performed by the living God right in front of their very eyes, they still cowered into selfish human beings. Oh the shame. Thousands of years later, aren’t we those very same selfish people? They definitely did not thrive in transition and that resulted in an even longer period of transition, but even worse- death for many as they could not stand in the face of a holy God. Let’s not follow their lead. In times of transition, then, let’s do the opposite of what the Israelites did. Let’s first focus on God and his provision. And second let’s focus on God and not self. Can you visualize the difference this would make? If God is leading, He will provide the way. He will be faithful through transition. 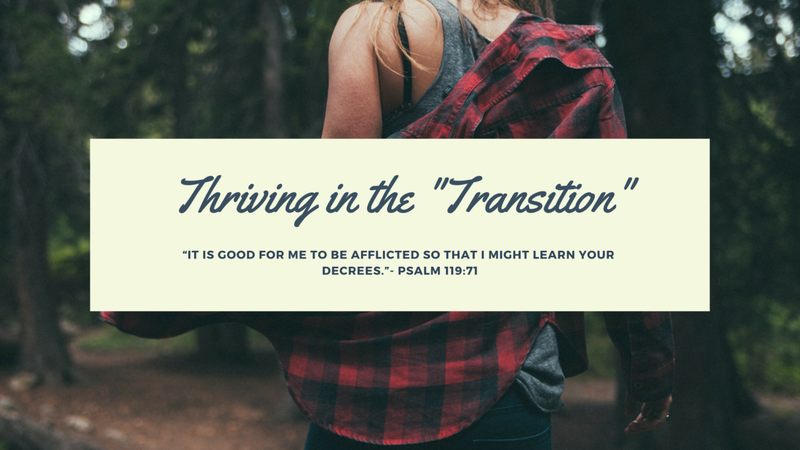 Transition should not have a negative connotation for especially those of us in ministry. It is the perfect opportunity for us to fully and truly rely on the Lord instead of on ourselves and our earthly comforts. Let’s honor the Lord through these times. Recognize the end of the previous season and trust God as He provides a new season for you and your family. He is able to do so much more than we can imagine.